Yesterday I was fortunate enough to visit an American style Diner in Chelsea called Corgi’s Deli (on Fulham Road). The place was filled with cakes and patisseries and stunning interior design – the kind of place where you would be proud to take your mother. They did a really good cup of coffee, but what was most appetising was the enormous array of cupcakes they had on display. Cue a conversation with my friend about cupcakes – ‘they’re really fashionable at the moment, didn’t you know?’ ‘But they’re just fairy cakes, we’ve always made them?’ ‘Yes, I know, but a friend sent me one as a gift the other day, it was very sweet and well decorated.’ ‘Aren’t they a bit more like muffins?’ Maybe, but the saying goes that you eat a muffin, because you believe it might be healthy, you eat a cupcake out of love. And the debate rages on… But I thought you’d enjoy this fai… er cupcake recipe that I found. Preheat oven to gas mark 5 or 190°C. 1. Melt the butter and pour into a bowl with the sugar, flour, eggs, milk, salt and vanilla extract. 3. Line the tray with cases and spoon the mix into the paper baking cups. 4. Bake the cakes in the centre of the oven for 18-20 mins (or until they’ve risen and are a light golden colour). 5. Take the cakes out of the oven. After they have cooled a little, transfer them to a wire rack to cool properly. 6. 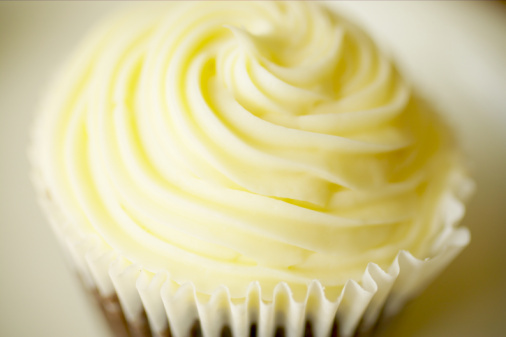 To make the buttercream you need to mix the egg white and sugar in a bowl placed over the top of a pan of hot water. Stir until the sugar dissolves completely (about 3 minutes). 7. Remove the bowl from over the pan and whisk the egg whites until stiff. 8. Gradually whisk in the butter and then, using a gentler speed, the lemon juice, waiting until each addition is absorbed before adding more, then the vanilla and the lemon essence. The mixture may appear to separate, but once it is all added, keep whisking at a high speed until it’s light and fluffy. 9. Fill the piping bag with the buttercream and pipe a swirl on top of each cupcake. If you want you can decorate the cupcakes with icing sprinkles. – These can be made by piping thin strips of coloured icing onto greaseproof paper using a very small size writing nozzle (no.2). Then leave the icing to dry and break it into short sprinkle type lengths. < Previous Turkish Delight – good or evil?